The BG Grid is a new generation grid EA. It can also be used for trading single orders without a grid and lot increase. It is most efficient on cross pairs on the М30 and Н1 timeframes. 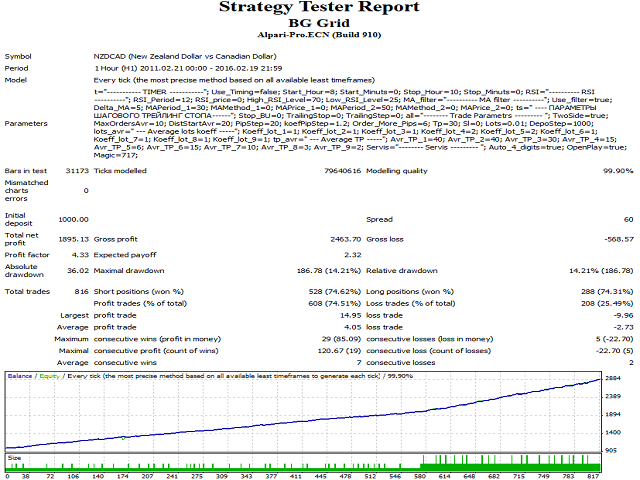 AUDCAD M30, GBPCAD M30, NZDCAD H1, GBPCHF H1. This is a counter-trend EA and it enters the market at the time of a possible correction of the trend. Entries are based on the standard MT4 indicators. 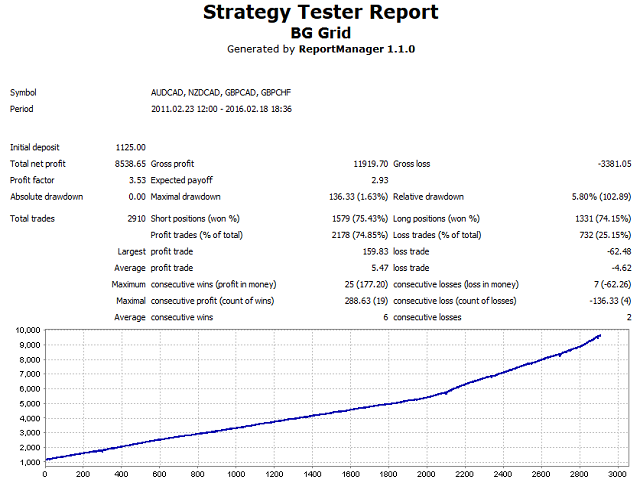 As any other grid EA, during a drawdown, the BG Grid places an order grid and eventually closes it in net profit by total take profit. But unlike most grid experts, the BG Grid allows to place an individual increase ratio for each traded lot size of every new order. It also includes a dynamic order grid step size. This property allows for operating the EA in a comfortable mode, without overloading the deposit. Another novelty is used in the EA is a changeable take profit level, based on the number of open orders. All these features make the EA unique, very flexible to adjustments and allows both the beginners and professionals work with it. These features have been confirmed by testing on history data over the last five years. 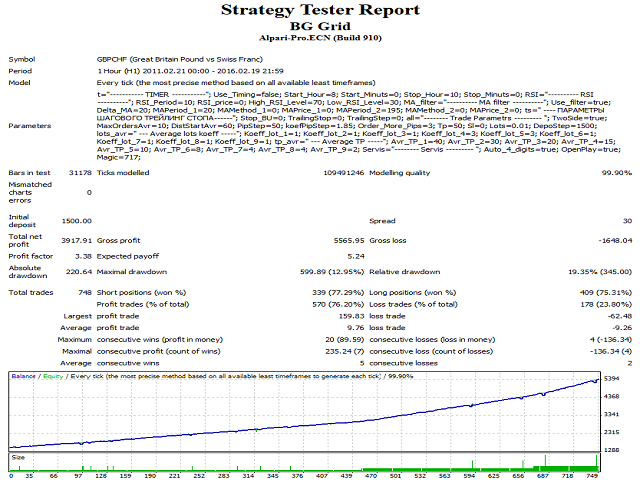 Testing was performed with 99,9% modeling quality with an increased spread, which is common for cent accounts. 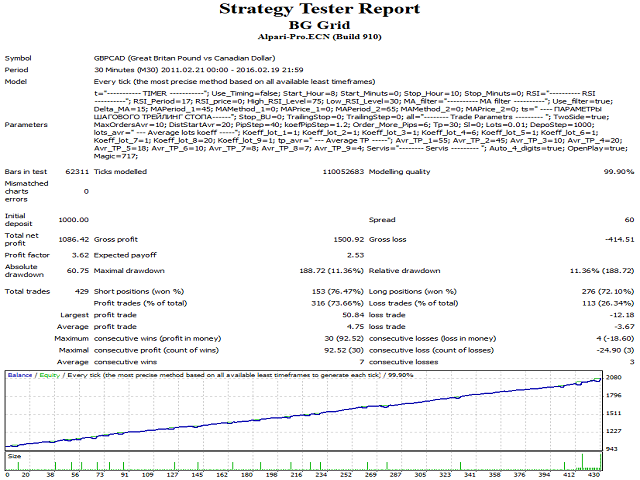 The report on the combined backtest on four currency pairs is also provided. The EA is recommended for multi-currency trading on the currency pairs presented above. The default settings of the ea should not be used for trading or testing. The files with the settings for each currency pair are provided in the first post in the "comments" section. For simultaneous operation on all four currency pairs, a deposit of no less than $1000-1500 or cents are recommended with the initial lot of 0.01 lot. At the same time for the AUDCAD, GBPCAD, NZDCAD currency pairs I recommend to use a deposit of $800-1000 with an initial lot of 0.01, the minimum deposit for the GBPCHF currency pair is 1000-1500$ with an initial lot of 0.01. That is, for trading the minimum initial volume of 0.01 lot on all four currency pairs at once, a total deposit of $1000-1500 is sufficient. The EA can work in the single trade mode. 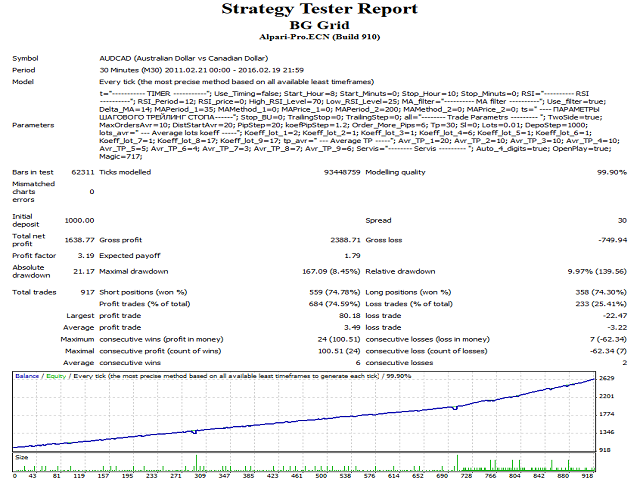 For best results on such strategy, a trailing stop is provided. A stop loss can be used to reduce the potential losses. Magic: unique number of the EA orders. Excellent expert and excellent support, I recommend it! This is a very good grid EA. It's flexible and can be optimize for many pairs. BG Grid has good possibilities but does need new parameters or it can quickly get out of control. Use the stop loss etc. The seller is very helpful and professional and offer me a refund:) I did not get this grid to work for me, my broker only had one pair, but it seams to be working good. Added possibility to close a grid of orders upon MA crossing. Removed part of user settings, which were not necessary.